Chocolate, coconut, walnuts, whey protein, chia, and pasture butter are known to possess remarkably healthful properties. These moist, chewy bars could qualify as super-food candy; it’s not an oxymoron. High intensity sugar substitute equal to 1/4 cup sugar (or to taste if cranberries are already sweetened), such as stevia or sucralose. Line an 8- x 8-inch square pan with waxed paper, parchment, or foil, leaving overhang of two sides to facilitate removal. Grease the paper or foil with butter or coconut oil or use cooking spray. Sprinkle 1/2 cup of toasted coconut in bottom of prepared pan. Mix 1/2 cup plain coconut with 2 tbsp. water. Stir and let stand for a few minutes until moist. Roughly chop dried cranberries. Place in a small bowl with 2 tbsp. water and high intensity sweetener. Cover and microwave for one minute. Stir and let stand until liquid is absorbed. Mix the moistened coconut and cranberries, the chia seeds, nuts, chocolate pieces, protein powder, second sugar substitute, salt, and cinnamon together in a large bow. Add egg white or reconstituted egg-white powder and stir until blended. Melt butter and coconut oil together, let cool until slightly warm so it won’t melt the chocolate, and stir into mixture in bowl, reserving about 3 tbsp. 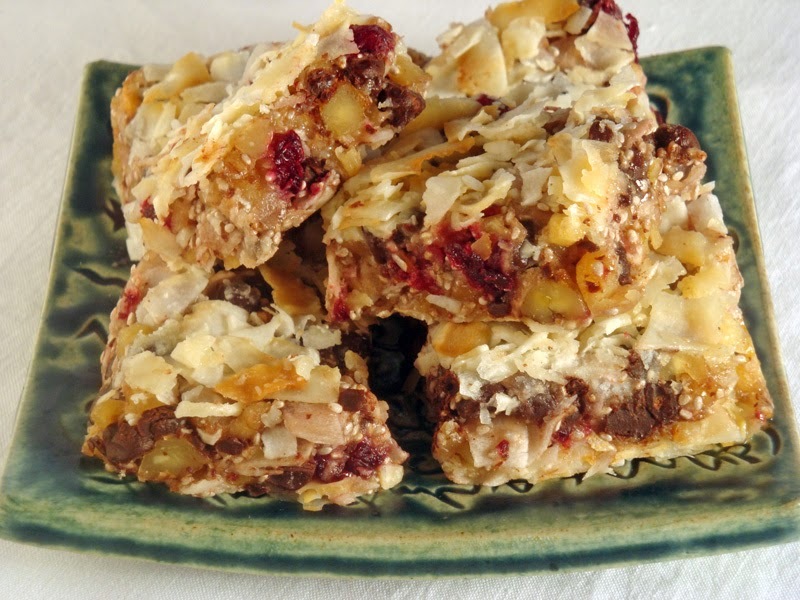 Spread coconut, cranberry, chocolate, and walnut mixture over toasted coconut in pan and press firmly in place. Sprinkle remaining toasted coconut on top. Drizzle with reserved butter and oil mixture. Cover with a second sheet of paper or foil and press down firmly so coconut adheres to candy. Chill for about 30 minutes or until firm; turn out of the pan and cut into 20 squares. Store in refrigerator but let warm up for a few minutes before serving. I’ve specified two kinds of sweetener for this recipe. The first one is high intensity, such as liquid sucralose, Splenda, or stevia. The second sweetener should have some bulk, such as an oligofructose blend (Sweet Perfection or Just Like Sugar for example) or a stevia blend with inulin, oligofructose, or erythritol. Other sweeteners with bulk, such as powdered xylitol or erythritol will also work. *This recipe is not cooked. You may use the whites from pasteurized eggs or reconstituted egg-white powder to avoid the slight risk of salmonella. See p. 187 in Nourished for egg safely tips. Spread coconut on a baking sheet and bake in an oven set to 325 degrees F for about 10 minutes or until lightly browned, stirring occasionally. Alternately, stir coconut in a dry skillet over medium heat for a few minutes until just slightly colored. Chia, Chocolate, Coconut, No-cook Cookies. Bookmark. Hi lucy! Thanks for the comment. I think it would be OK to use the whole egg–it might change the texture a little and make it more creamy and less chewy. Let me know how it turns out if you try it! I'm wondering if it would be ok to use the whole egg? Thanks! I don’t see a quantity specified for the cinnamon, so I’m going to add a teaspoon and hope that works! Oops, No one notice that before! I’d start with less than a teaspoon and see how it works. I’ll try to find my original version of the recipe to see what it is supposed to be. Thanks for the heads UP! Marie, I posted a reply, but it doesn’t seem to be here now! I suggested that you start with less than a teaspoon, perhaps 1/2 teaspoon, and see how you like it. Thanks for the heads up about the omission. I’ll see if I can find the original recipe to check the correct amount.